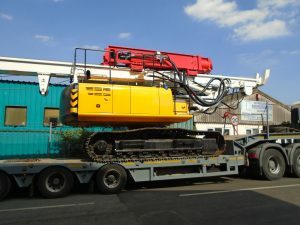 Tritech Ground Engineering, part of the larger A E Yates group of companies, has recently taken delivery of the UK’s first radio-controlled BSP JX-8 piling rig mounted on a low ground pressure JCB JS200 crawler carrier. 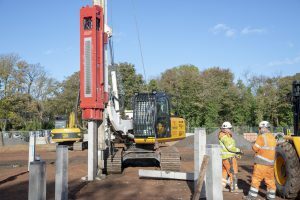 Tritech Ground Engineering was formed to supply a variety of piling services to the Group and its broad customer base and in the short time of trading has built a large and diverse customer base across the country. Offering a range of CFA, bored, driven and vibro-piling solutions, the company operates a wide range of rigs in excess of 80 tonnes operating weight. The latest addition to the fleet of piling equipment is at the smaller end of the equipment scale and has been specifically designed to offer their customers one of the highest capacity/lowest ground pressure combinations anywhere in the UK. For cost and time-conscious developers, piled foundations require a detailed engineered piling mat to be placed around the area to be piled. Facilitating this work can involve large amounts of material either being brought into site or existing material being engineered to a specific weight bearing design in order to carry the piling rig. The new BSP JX-8 rig has been built to use the minimum requirements for heavily engineered piling mats and puts Tritech in a market leading position for UK housebuilders. Already operating an earlier JX8 rig, Karl Amos, Operations Manager at Tritech, looked at tweaking the new arrival’s design to make it more productive and easier in operation. Mounted on a JCB JS200 carrier, the piling equipment is a collaboration between Colets Piling and BSP and comprises a 12.5m single mast and BSP DX25 Hydraulically accelerated drop hammer. 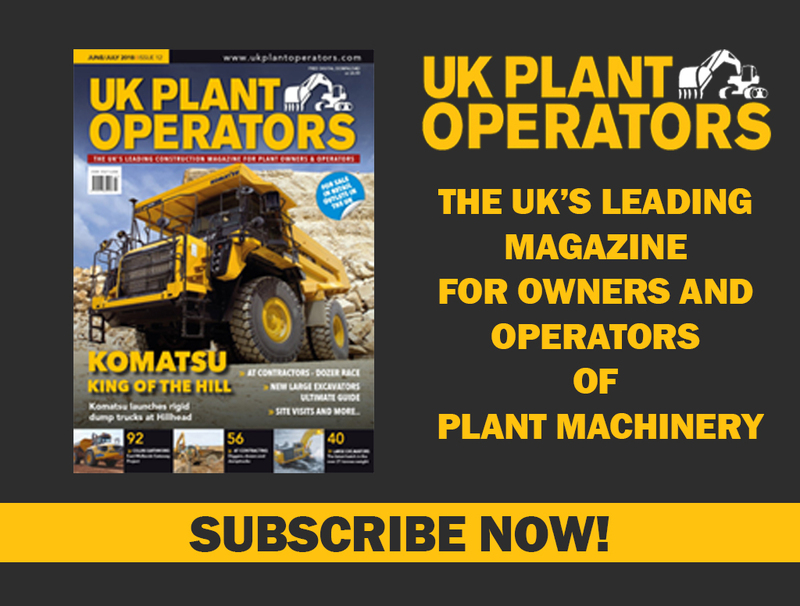 The choice of carrier has been a straight forward one for Colets who have constructed a number of piling rigs around the tried and tested JCB chassis. The latest Tritech version incorporates the Staffordshire based manufacturers latest Tier4 emissions compliant diesel engine. The carrier is a standard offering from JCB with the addition of an upgraded, heavy-duty slew ring added to take the extra weight from the larger counterweight and piling equipment. The piling equipment comprises a fixed 12.5m boom capable of handling piles of up to 8m in length. Karl explains that whilst they regularly drive piles up to 4m in length, the option to go to a maximum of 8m increases the versatility of the rig. A Primary braked winch carries the 4.5t piling hammer whilst a secondary winch is used to handle the piles. This version of the rig incorporates a mast foot and pile guide, a very useful addition according to Karl. The BSP DX25 hammer is an ideal tool for this sort of work combining a robust build with productivity unsurpassed for its size. Requiring just 150 litres per minute of oil flow at 160bar, the hammer can deliver up to 25kNm at 60bpm (blows per minute). This performance far exceeds the requirement on most projects for concrete driven piles resulting in the machine working at just 25% power for fear of damaging the pile tops. This also keeps the diesel fuel consumption of the base rig to a minimum, another important factor to consider in today’s word! Currently, rig fuel consumption is between six and seven litres per hour. The combined weight of the rig is just over 27 tonnes and this light weight, combined with a wide and long undercarriage reduces the ground pressure imposed by the machine to just 82kN/m2 without a pile. The design of the rig means that the weight of the outfit is only increased when a pile is lifted into position and reduces again as the weight of the hammer is carried through the pile once it is located in the driving position. 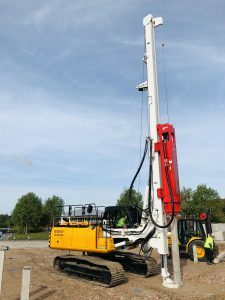 One of the first projects for the new rig was in Formby where Tritech had been engaged to drive almost 450, 150mm concrete piles for a new housing development. Working for the ground work sub-contractor, Tritech was able to mobilise the new outfit quickly thanks to the reduction in engineering works prior to the company starting on site. This reduction in work also meant that other civils work were able to carry on ahead of the piling team. The compact design of the rig means that it fits easily onto a standard step-frame trailer without impacting on transport dimensions. Whilst the compact dimensions benefit travelling between sites, the rig is also very quick to set up and can be ready to work within minutes of reaching site. One of the major benefits of the new rig is its controllability. Whereas the older version is operated solely from the carrier’s cab, the new version is also operated from a remote control box. 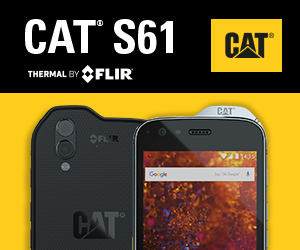 Mirroring the in-cab control system, the remote allows the operator to see everything around the machine at all times. The design of the new rig has impressed both the management and operators at Tritech who are all extremely happy with the quality and productivity of the outfit. With the increase in house building looking like it is not dropping away, the purchase of this rig and its earlier sibling has proved to be beneficial to the company. 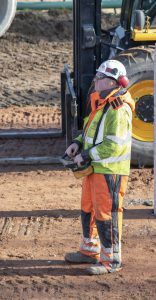 In conclusion, the added safety from the remote operating system resulting in higher productivity along with the reduction in associated engineering costs for the clients has put Tritech in the driving seat to deliver just what major housebuilders want, a cost effective and safe piling solution.